See below for transcripts of the video at the following link where you can view a 2 hour video edited from 20 hours of video of the Santa Barbara week of events initiating the Rainbow Uprising Campaign, in January 1990, including the message of The Great Law of Peace and the Tree of Peace, and the official Hopi Prophecy message as of that time preparing to "open the door to the House of Mica", and including actor Jon Voight's personal experiences discussion of that Hopi Prophecy and about his experience with the Six Nations and Chumash peoples and their spiritual teachings. The name Rainbow Uprising was originally inspired by the Santa Barbara Chapter of the Fellowship of Reconciliation organization sponsored visit to Santa Barbara by the head of the Palestinian Center for Nonviolence in Jerusalem, who explained before 1990 that the Arabic word "intifada" properly translated into English has the spiritual meaning of "the self-purification process of uprising consciousness to a higher level from which the solutions to problems can be seen". He further said that this true meaning has been ignored by those resorting to violence under the color of the so-called Palestinian Uprising or Islamic Intifada, as contrasted with the concept of holy war or Jihad in Arabic. Hence the Rainbow Uprising Campaign was inspired to mean the self-purification process for uprising human consciousness to understand and embrace our mutual relationship as one human family of life on Earth, Our Family of Life. 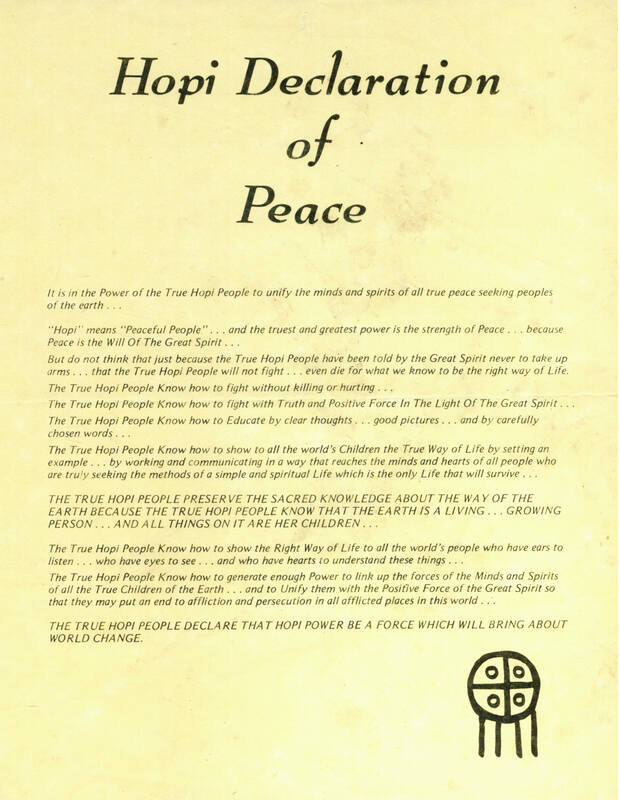 Please also study the one-page classic Hopi Declaration of Peace. See scans of the 7 pages from the original magazine at these links: Page 1, Page 2, Page 3, Page 4, Page 5, Page 6, Page 7. January 9, 2005, marked the 20th anniversary of the death of the most venerable Nichidatsu Fujii whose 5th demise anniversary in January 1990 was observed in Santa Barbara with the installation of the Hiroshima Peace Flame on UCSB's eternal flame monument concluding a week of events under auspices of the Rainbow Uprising Campaign, including participation of local Chumash spiritual leaders Choy Slo and Pilulah Khus, Mohawk Chief Jake Swamp of the Six Nations Iroquois Haudenosaunee Confederacy, traditional Hopi interpreter Thomas Banyacya, actor Jon Voigt, local scientist Bruce DePalma, local community leaders Marc McGinnes and Gene Knudsen-Hoffman and Hymon Johnson president of the local Sathya Sai Baba fellowship, Buddhist Monks of the Nipponzan Myohoji order founded by Nichidatsu Fujii, Soto Zen Buddhist Monk Yusen Yamato, et al. The video recordings of these events were reviewed and transcribed into the following articles published in San Francisco, hence the odd punctuation in parts as the typist tried to maintain the oral character of their talks at some expense to punctuation. The 20th anniversary of the Tree of Peace planting at UCSB was May 16, 2005. 1990 also marked the 67th birthday of India's contemporary spiritual teacher, Sri Sathya Sai Baba, one of whose teacher trainers, Dr. Hymon Johnson, carried the Hiroshima Peace Flame in the below described Global Peace Walk procession from UCSB's Tree of Peace when it was installed as the Eternal Flame at UCSB by a Hiroshima A-bomb survivor. The teaching of the most venerable Nichidatsu Fujii, founder of the Nipponzan Myohoji, is that the American Indian people must take the lead in the world peace movement because of their karmic relationship to the United States government, which is a major problem in the world because of its initiation of the nuclear threat. Basically, the Japanese monks understand that everything is based on recognition of the natural law, and that law is behind the traditions of the American Indian spiritual people. As the people of the world recognize sovereignty, the jurisdiction of the natural law, then they will also recognize the sovereignty and culture of the Native American people as well. "You must eliminate the frame of mind considering that the peace pagoda belongs to a different faith when paying veneration to it. Instead, see it as the God of your own faith. This is the reason for erecting a peace paogda, the reason for the apparition of the Stupa." Venerable Fujii died on January 9, 1985, at the age of ninety nine at Atami temple in Japan. From January 7, to January 13th, the Rainbow Uprising Campaign was convened in Santa Barbara, California. The inspiration for the campaign comes from the observations of mutual fulfillment of Native American, Tibetan and Japanese Buddhist prophecies. The Rainbow Uprising Campaign is a scientific and spiritual revolution of consciousness to change the course of human history off of the path toward total destruction and onto the path toward true peace and harmony among all life, by bringing out the fundamental teachings of nonviolence. Participants in a series of events included: Chief Jake Swamp of the Mohawk Nation, Hopi Interpreter Thomas Banyacya, Zen Monk Usen Yamato, Monks of the Nipponzan Myohoji, Actor Jon Voight, Venerable Khenpo Karthar Rimpoche, Scientist Bruce DePalma, Hiroshima survivor Kaz Suyieshi and many others. The focus of the campaign was the rededication on January 9th of the Tree of Peace planted five years previously and the installation of the Hiroshima Peace Flame. Both these events took place on the University of California Santa Barbara Campus and were followed by a Spiritual Unity Summit on Nonviolence as part of the annual activities honoring Dr. Martin Luther King. 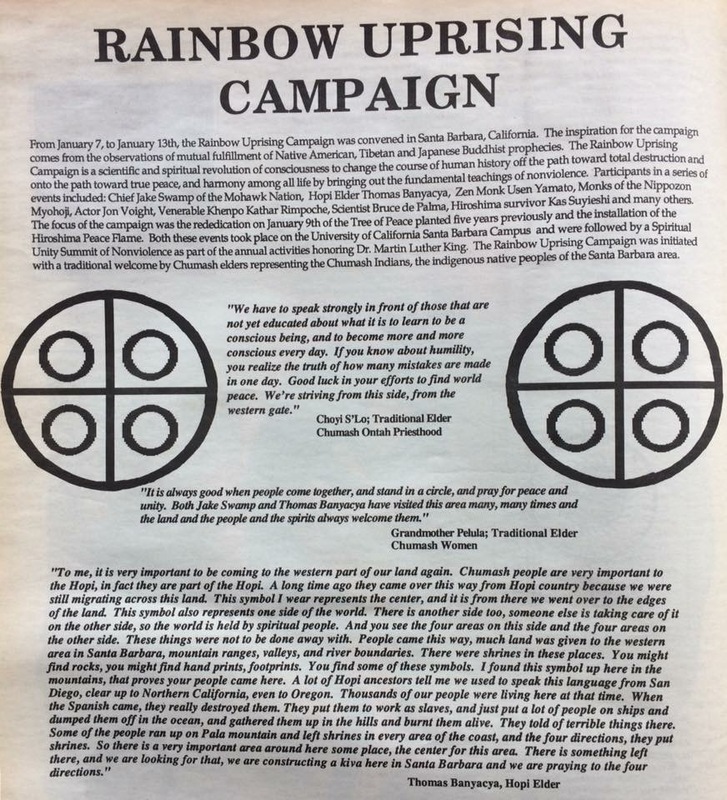 The Rainbow Uprising Campaign was initiated with a traditional welcome by Chumash elders representing the Chumash Indians, the indigenous native peoples of the Santa Barbara area. "We have to speak strongly in front of those that are not yet educated about what it is to learn to be a conscious being, and to become more and more conscious every day. If you know about humility, you realize the truth of how many mistakes are made in one day. Good luck in your efforts to find world peace. We're striving from this side, from the Western Gate." "It is always good when people come together, and stand in a circle, and pray for peace and unity. Both Jake Swamp and Thomas Banyacya have visited this area many, many times and the land and the people and the spirits always welcome them." "To me, it is very important to be coming to the western part of our land again. 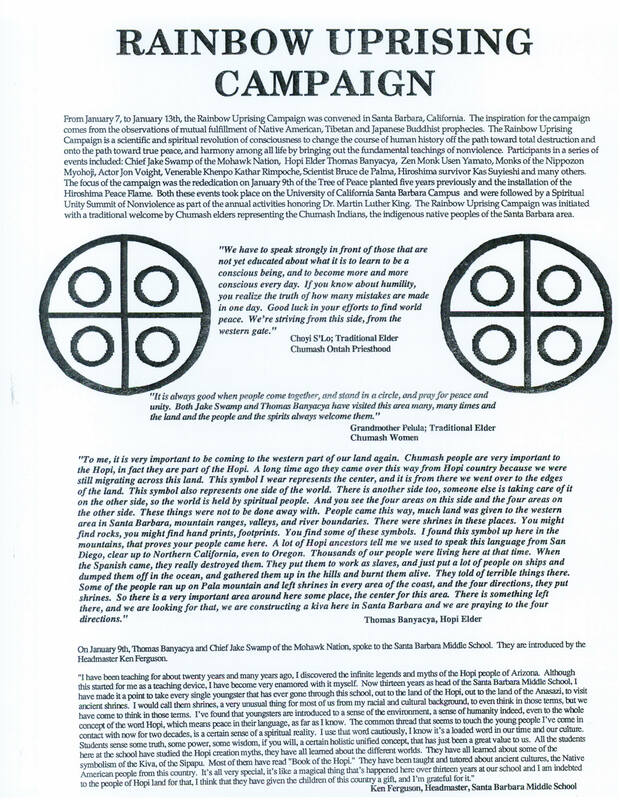 Chumash people are very important to the Hopi, in fact they are part of the Hopi. A long time ago they came over this way from Hopi country because we were still migrating across this land. This symbol I wear represents the center, and it is from there we went over to the edges of the land. This symbol also represents one side of the world. There is another side too, someone else is taking care of it on the other side, so the world is held by spiritual people. And you see the four areas on this side and the four areas on the other side. These things were not to be done away with. People came this way, much land was given to the western area in Santa Barbara, mountain ranges, valleys, and river boundaries. There were shrines in these places. You might find rocks, you might find hand prints, footprints. You find some of these symbols. I found this symbol up here in the mountains, that proves our people came here. A lot of Hopi ancestors tell me we used to speak this language from San Diego, clear up to Northern California, even to Oregon. Thousands of our people were living here at that time. When the Spanish came, they really destroyed them. They put them to work as slaves, and just put a lot of people on ships and dumped them off in the ocean, and gathered them up in the hills and burnt them alive. They told of terrible things there. Some of the people ran up on Pala mountain and left shrines in every area of the coast, and the four directions, they put shrines. So there is a very important area around here some place, the center for this area. There is something left there and we are looking for that. We are constructing a Kiva here in Santa Barbara and we are praying to the four directions." On January 9th, Thomas Banyacya and Chief Jake Swamp of the Mohawk Nation, spoke to the Santa Barbara Middle School. "I have been teaching about twenty years and many years ago I discovered the infinite legends and myths of the Hopi people of Arizona. Although this started for me as a teaching device, I have become very enamored with it myself. Now thirteen years as head of the Santa Barbara Middle School, I have made it a point to take every single youngster that has ever gone through this school, out to the land of the Hopi, out to the land of the Anasazi, to visit ancient shrines. I would call them shrines, a very unusual thing for most of us from my racial and cultural background, to even think in those terms, but we have come to think in those terms. I've found that youngsters are introduced to a sense of the environment, a sense of humanity indeed, even to the whole concept of the word Hopi, which means peace in their language, as far as I know. The common thread that seems to toucan the young people I've come in contact with now for two decades, is a certain sense of a spiritual reality. I use that word cautiously, I know it's a loaded word in our time and our culture. Students sense some truth, some power, some wisdom, if you will, a certain holistic unified concept, that has just been a great value to us. All the students here at the school have studied the Hopi creation myths, they have all learned about the different worlds. They have all learned about some of the symbolism of the Kiva, of the Sipapu. Most of them have read "Book of the Hopi." They have been taught and tutored about our ancient cultures, the Native American people from this country. It's all very special, it's like a magical thing that's happened here over thirteen years at our school and I am indebted to the people of the Hopi land for that. I think that they have given the children of this country a gift, and I'm grateful for it." We have been working very hard for many years to explain the importance of understanding Native philosophy. I believe, and other leaders of Native cultures believe, that we have come out to share our philosophy in order to enter into the new future that we are trying to build. This involves many different types of people, many different types of cultures. We have to finally accept one another as people, as human beings. We should have a common knowledge of what our responsibility is and to have reverence for everything we see around us. What happens in our nation is that whenever we have a gathering, we give thanks first before we go into any kind of a discussion. That thanksgiving involves reminding ourselves how much the Earth Mother provides for us. Also, we thank all the grass that grows around us, because every blade of grass has a purpose in life and we are part of that life cycle. So we are tied to everything, all the trees, the water, everything that we see around us, the birds. They say that the birds were created to come and fly around our heads and sing beautiful songs so that when sometimes we are lonesome, they come and sing their songs and that makes us feel better. Our people have gone through a lot in their history, especially at the time of the dark period. In those days our people forgot how to give thanks and pretty soon they were at war with one another. Then what happened was, a Peacemaker was born amongst the Huron people. That was on the northern shores of what is known as Lake Ontario today. When that child grew up to a young man, he announced that he had a mission to fulfill and that he must travel across the water of the lake and go in the direction of the east. He said there were a people living over there that continued to destroy one another and a lot of blood was flowing. They said in those times even the streams of water had blood mixed with the water. Everything was so negative at that time. The time came when the Peacemaker walked amongst the people that lived in that area. 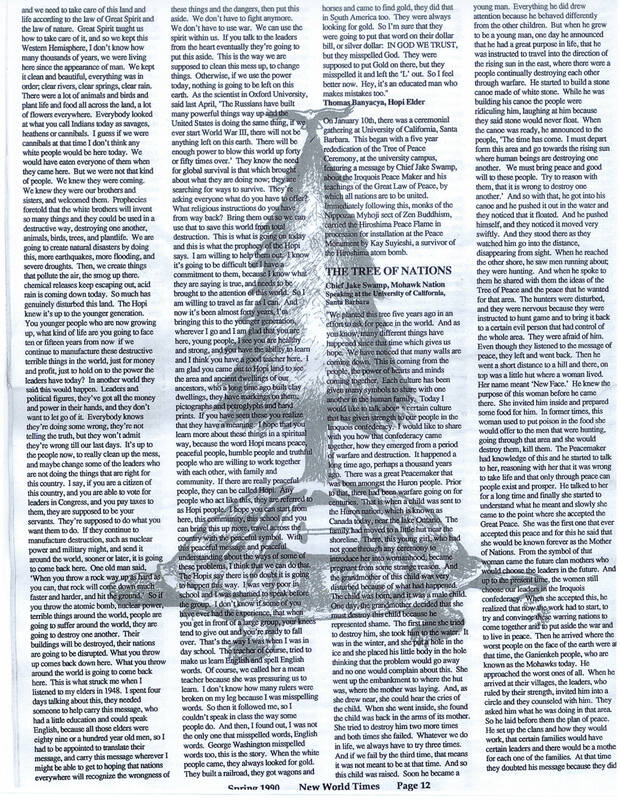 There was a time they erected a Tree of Peace. The Peacemaker said, "We now uproot this tree, and now there is a cavity formed in the earth. Today we instruct you to take your weapons from yourselves, your feelings of hatred, greed and jealousy and you will cast them into this hole in the ground. Underneath this ground, this hole in the earth, is a strong current of water that goes to the unknown regions. And they will take away the weapons from sight forever. From now on you will live under the principles of the Great Law of Peace. This is how we are supposed to look in the future, far into the future. For in our actions today we must be careful, we might be doing something that will affect the generations to come. In the meantime we just have to share with one another our thoughts, our feelings, and we can try to spread the love around the world so that finally everyone, no matter what color they are can hold hands with one another and have a true and lasting peace. It's true I was very young when the Hopi elders, along with my elders came together and decided that it was time now to reawaken our brothers and sisters of the many different nations on our North American continent. These were very important times for everyone because at the same time other people were trying to prove that they had a freedom that should be exercised. Now we are wondering, where are we going from here? It's true that we can look back at our past, the different wrongs that have been committed, we can think about those things, yet at the same time we can look at the future with some kind of vision that comes from the heart and the mind. I believe that in the beginning of time human beings evolved from a certain place and then they populated the world from that point. So I suppose that we all had original instruction that meant that same thing because when I travel to different areas, to other Indian nations or other indigenous peoples, I realize that we have something in common: our prophecies, our clan systems, our ceremonies, they all mean the same thing. They might be expressed in different ways, but the logic behind it is the same. That gives me a strength of some kind that we need in the future. We need to hold on to one another as a human family, maybe finally, we will reach that time when there will be peace in the world. Maybe, even if we in this room will not see that time, but we know that we are a part of the beginning of something very great, we must find the strength to carry on that work. There are not too many people doing it because when you do this kind of work there is much suffering. It takes you away from your family. It's very hard when you are across the country thinking about your family: Are they safe, are they fed, are they secure? It's a problem, but yet when I am across the country and I meet my own clan, I know that our elders always told us, "Whenever you go to other nations you'll find your own clan, that's your family, and they'll take care of you." Later on this month we are going to be starting our midwinter ceremonies that prepare us for the coming cycle. We again see the Maple trees give their sap so we can make the sugar, the first sign of food coming back. When we perform the gathering ceremonies, we are made very happy. That is how it's supposed to be on this earth, enjoying life because that's the way the creator, the Great Spirit wants us to be happy on this land. He wants laughter, you know, all the time. We're not supposed to be sad, we're supposed to be happy. So you'll notice in very hard times, and we've gone through many hard times when we were close to being destroyed, even in those troubled times we managed to laugh. It's so simple, what we were instructed to do. Just to say thank you for everything that we see around us. That's how simple our way of life is, to enjoy. They said the Great Spirit has no face to our eyes, it was hidden from us. There's a point in time when we will recognize that, but for now, there were words that were left here to show our people's feeling towards what is around us. That's what makes our family strong to carry on, to show our gratitude for the different gifts we have been receiving from the beginning of time. As long as that continues, the circle of life will continiue. It's true that we are in troubled times. We must find a way to develop the healing that needs to take place. There are many grieving people in the world today. They are suffering inside. We must console the people, to put the new sun in the sky, to brighten the day again. When Hiawatha received his vision in those troubled times before the Great Law of Peace came about, there was much suffering caused by warfare; there was much destruction all over the land. At that time, Hiawatha's wife and his children were destroyed and so Hiawatha became grief stricken and he finally decided that he should not be seen by other people in his condition, that he would rather suffer by himself. So he imposed upon himself that he would leave his area, he would leave his nation, never to come back, because he felt so badly inside. His heart was broken through the grief that was caused by the loss of his loved ones and so he went in the direction of the forest. He said to himself, "I will walk with no more direction until the forest claims my life and nobody will find a trace of where I am" He was wandering aimlessly about. At the same time as he was traveling in that way, the Peacemaker, who had been born prior to that time, was traveling in the direction of the Nogayaga people, our people the Mohawks, trying to bring peace as he walked. Hiawatha was different, he received the special message. Then he came upon this little water pond and he noticed something happening which took him briefly away from his grief and brought him back to reality. As he watched the water, ducks were flying in from all directions. Soon they had covered the water. He crouched down and he continued to watch, and then they were suddenly startled and they all flew away at once, taking with them the water that was in the pond. As he looked, he saw exposed shiny things. He walked over and as he started to pick them up and inspect them, and he started to think about his grief and now he was brought to reality, he wondered what he would do. He said to himself, "When first in grief the tears start to come, they cover and blur the vision for that person. They no longer can see the future clearly because of the tears that are coming." So he said, "This is what I would do for that person, I would reach heavenward and I would bring forth the softest skin of the fawn and I would use this to wipe the tears away from this person and I would make a special request from the great powers, that this person again see clearly in the next new sunlight, when the new sun comes up." And then he mentioned what happens to a person in grief when they lose a loved one. He said, "The dust of death will settle in the ears, preventing that person from hearing their family talking to them." 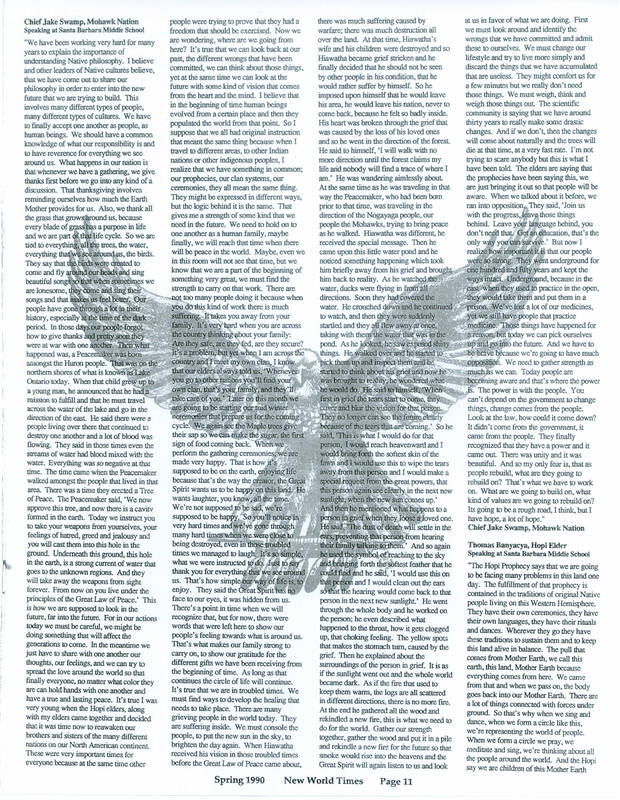 And so again he used the symbol of reaching to the sky and bringing forth the softest feather that he could find and he said, "I would use this on that person and I would clear out the ears so that the hearing would come back to that person in the next new sunlight." He went through the whole body and he worked on the person; he even described what happened to the throat, how it gets clogged up, that choking feeling. The yellow spots that makes the stomach turn, caused by the grief. Then he explained about the surroundings of the person in grief. It is as if the sunlight went out and the whole world became dark. As if the fire that used to keep them warm, the logs are all scattered in different directions, there is no more fire. At the end he gathered all the wood and rekindled a new fire, this is what we need to do for the world. Gather our strength together, gather the wood and put it in a pile and rekindle a new fire for the future so that smoke would rise into the heavens and the Great Spirit will again listen to us and look at us in favor of what we are doing. First we must look around and identify the wrongs that we have committed and admit these to ourselves. We must change our lifestyle and try to live more simply and discard the things that we have accumulated that are useless. They might comfort us for a few minutes but we really don't need those things. We must weigh, think and weigh those things out. The scientific community is saying that we have around thirty years to really make some drastic changes. And if we don't, then the changes will come about naturally and the trees will die at that time, at a very fast rate. I'm not trying to scare anybody but this is what I have been told. The elders are saying that the prophecies have been saying this, we are just bringing it out so that people will be aware. When we talked about it before, we ran into opposition. They said, "Join us with the progress, leave those things behind. Leave your language behind, you don't need that. Get an education, that's the only way you can survive." But now I realize how important it is that our people were so strong. They went underground for one hundred and fifty years and kept the ways intact. Underground, because in the east when they used to practice in the open, they would take them and put them in a prison. We've lost a lot of our medicines, yet we still have people that practice medicine. Those things have happened for a reason, but today we can pick ourselves up and go into the future. And we have to be brave because we're going to have much opposition. We need to gather strength as much as we can. Today people are becoming aware and that's where the power is. The power is with the people. You can't depend on the government to change things, change comes from the people. Look at the law, how could it come down? It didn't come from the government, it came from the people. They finally recognized that they have a power and it came out. There was unity and it was beautiful. And so my only fear is, that as people rebuild, what are they going to rebuild on? That's what we have to work on. What are we going to build on, what kind of values are we going to rebuild on? It's going to be a rough road, I think, but I have hope, a lot of hope. ...and we need to take care of this land and life according to the law of Great Spirit and the law of nature. Great Spirit taught us how to take care of it, and so we kept this Western Hemisphere, I don't know how many thousands of years, we were living here since the appearance of man. We kept it clean and beautiful, everything was in order; clear rivers, clear springs, clear rain. There were a lot of animals and birds and plant life and food all across the land, a lot of flowers everywhere. Everybody looked at what you call Indians today as savages, heathens or cannibals. I guess if we were cannibals at that time I don't think any white people would be here today. We would have eaten every one of them when they came here. But we were not that kind of people. We knew they were coming. We knew they were our brothers and sisters, and welcomed them. Prophecies foretold that the white brothers will invent so many things and they could be used in a destructive way, destroying one another, animals, birds, trees, and plant life. We are going to create natural disasters by doing this, more earthquakes, more flooding, and severe droughts. Then, we create things that pollute the air, the smog up there. Chemical releases keep escaping out, acid rain is coming down today. So much has genuinely disturbed this land. The Hopi knew it's up to the younger generation. You younger people who are now growing up, what kind of life are you going to face ten or fifteen years from now if we continue to manufacture these destructive terrible things in the world, just for money and profit, just to hold on to the power the leaders have today? In another world they said this would happen. Leaders and political figures, they've got all the money and power in their hands, and they don't want to let go of it. Everybody knows they're doing some wrong, they're not telling the truth, but they won't admit they're wrong until our last days. It's up to the people now, to really clean up the mess, and maybe change some of the leaders who are not doing the things that are right for this country. I say, if you are a citizen of this country, and you are able to vote for leaders in Congress, and you pay taxes to them, they are supposed to be your servants. They're supposed to do what you want them to do. If they continue to manufacture destruction, such as nuclear power and military might, and send it around the world, sooner or later, it is going to come back here. One old man said, "When you throw a rock way up as hard as you can, that rock will come down much faster and harder and hit the ground." So if you throw the atomic bomb, nuclear power, terrible things around the world, people are going to suffer around the world, they are going to destroy one another. Their buildings will be destroyed, their nations are going to be disrupted. What you throw up comes back down here. What you throw around the world is going to come back here. This is what struck me when I listened to my elders in 1948. I spent four days talking about this, they needed someone to help carry this message, who had a little education and could speak English, because all those elders were eighty, ninety or a hundred years old men, so I had to be appointed to translate their message, and carry this message wherever I might be able to get to, hoping that nations everywhere will recognize the wrongness of these things and the dangers, then put this aside. We don't have to fight any more. We don't have to use war. We can use the spirit within us. If you talk to the leaders from the heart eventually they're going to put this aside. This is the way we are supposed to clean this mess up, to change things. Otherwise if we use the power today, nothing is going to be left on this earth. As the scientists at Oxford University said last April, "The Russians have built many powerful things way up and the United States is doing the same thing. If we ever start World War III, there will not be anything left on this earth. There will be enough power to blow the world up forty or fifty times over." They know the need for global survival is that which brought about what they are doing now; they are searching for ways to survive. They're asking everyone what do you have to offer? What religious instructions do you have from way back? Bring them out so we can use that to save this world from total destruction. This is what is going on today and this is what the Hopi Prophecy says. I am willing to help them out. I know it will be difficult but I have a commitment to them, because I know what they are saying is true, and needs to be brought to the attention of this world. So I am willing to travel as far as I can. And now it's been almost forty years. I'm bringing this to the younger generation wherever I go and I am glad that you are here, young people. I see you are healthy and strong and you have the ability to learn and I think you have a good teacher here. I am glad you came out to Hopi land to see the area and ancient dwellings of our ancestors, who a long time ago built clay dwellings, they have markings on them, pictographs and petroglyphs and hand prints. If you have seen these you realize that they have a meaning. I hope that you learn more about these things in a spiritual way, because the word Hopi means peace, peaceful people, humble people and truthful people who are willing to work together with each other, with family and community. If there are really peaceful people, they can be called Hopi. Any people who act like this, they are referred to as Hopi people. I hope you can start from here, this community, this school and you can bring this up more, travel across the country with the peaceful symbol. With this peaceful message and peaceful understanding about the ways of some of these problems, I think that we can do that. The Hopis say there is no doubt it is going to happen this way. I was very poor in school and I was ashamed to speak before the group. I don't know if some of you have ever had the experience, that when you get in front of a large group, your knees tend to give out and you're ready to fall over. That's the way I was when I was in day school. The teacher of course, tried to make us learn English and spell English words. Of course, we called her a mean teacher because she was pressuring us to learn. I don't know how many rulers were broken on my leg because I was misspelling words. So then it followed me, so I couldn't speak in class the way some people do. And then, I found out, I was not the only on that misspelled words, English words. George Washington misspelled words too, this is the story. When the white people came, they always looked for gold,. They built a railroad, they got wagons and horses and came to find gold, they did that in South America too. They were always looking for gold. So I'm sure that they were going to put that word on their dollar bill, or silver dollar, "In God We Trust," but they misspelled God. They were supposed to put Gold on there, but they misspelled it and left the "L" out. So I feel better now. Hey, it's an educated man who makes mistakes too. On January 10th, there was a ceremonial gathering at the University of California, Santa Barbara. This began with a five year rededication of the Tree of Peace Ceremony, at the university campus, featuring the message by Chief Jake Swamp about the Iroquois Peace Maker and his teachings of the Great Law of Peace by which all nations are to be united. Immediately following this, monks of the Nipponzan Myohoji sect of Zen Buddhism [escorted, drumming and chanting] the Hiroshima Peace Flame in procession for installation at the Peace monument by Kaz Suyieshi, a survivor of the Hiroshima atom bomb. We planted this tree five years ago in an effort to ask for peace in the world. And as you know, many different things have happened since that time which gives us hope. We have noticed that many walls are coming down. This is coming from the people, the power of hearts and minds coming together. Each culture has been given many symbols to share with one another in the human family. Today I would like to talk about a certain culture that has given strength to our people in the Iroquois Confederacy. I would like to share with you how that confederacy came together, how they emerged from period of warfare and destruction. It happened a long time ago, perhaps a thousand years ago. There was a great Peacemaker that was born amongst the Huron people. Prior to that, there had been warfare going on for centuries. That is when a child was sent to the Huron nation, which is known as Canada today, near the lake Ontario. The family had moved to a little hut near the shoreline. There, this young girl, who had not gone through any ceremony to introduce her into womanhood, became pregnant from some strange reason. And the grandmother of this child was very disturbed because of what had happened. The child was born, and it was a male child. One day, the grandmother decided that she must destroy this child because he represented shame. The first time she tried to destroy him, she took him to the water. It was in the winter, and she put a hole in the ice and she placed his little body in the hole thinking that the problem would go away and no one would complain about this. She went up the embankment to where the hut was, where the mother was laying. And, as she drew near, she could hear the cries of the child. When she went inside, she found the child was back in the arms of its mother. She tried to destroy him two more times and both times she failed. Whatever we do in life, we always have to try three times. And if we fail by the third time, that means it was not meant to be at that time. And so this child was raised. Soon he became a young man. Everything he did drew attention because he behaved differently from the other children. But when he grew to be a young man, one day he announced that he had a great purpose in life, that he was instructed to travel into the direction of the rising sun in the east, where there were a people continually destroying each other through warfare. He started to build a stone canoe made of white stone. While he was building his canoe the people were ridiculing him, laughing at him because they said stone would never float. When the canoe was ready, he announced to the people, "The time has come. I must depart from this area and go towards the rising sun where human beings are destroying one another. We must bring peace and good will to these people. Try to reason with them, that it is wrong to destroy one another." And so with that, he got into his canoe and he pushed it out in the water and they noticed it floated. And he pushed himself, and they noticed it moved very swiftly. And they stood there as they watched him go into the distance, disappearing from sight. When he reached the other shore, he saw men running about; they were hunting. And when he spoke to them he shared with them the ideas of the Tree of Peace and the peace that he wanted for that area. The hunters were disturbed, and they were nervous because they were instructed to hunt game and to bring it back to a certain evil person that had control of the whole area. They were afraid of him. Even though they listened to the message of peace, they left and went back. Then he went a short distance to a hill and there, on top was a little hut where a woman lived. Her name meant "New Face." He knew the purpose of this woman before he came there. She invited him inside and prepared some food for him. In former times, this woman used to put poison in the food she would offer to the men that were hunting, going through that area and she would destroy them, kill them. The Peacemaker had knowledge of this and he started to talk to her, reasoning with her that it was wrong to take life and that only through peace can people exist and prosper. He talked to her for a long time and finally she started to understand what he meant and slowly she came to the point where she accepted the Great Peace. She was the first one that ever accepted this peace and for this he said that she would be known forever as the Mother of Nations. From the symbol of that woman came the future Clan Mothers who would choose the leaders in the future. And up to the present time, the women still choose our leaders in the Iroquois Confederacy. When she accepted this, he realized that now the work had to start, to try and convince these warring nations to come together and put aside the war and to live in peace. Then he arrived where the worst people on the face of the earth were at that time, the Ganienkeh people, who are known as the Mohawks today. He approached the worst ones of all. When he arrived at their villages, the leaders, who ruled by their strength, invited him into a circle and they counseled with him. They asked him what he was doing in that area. So he laid before them the plan of peace. He set up the clans and how they would work, that certain families would have certain leaders and there would be a mother for each one of the families. At that time they doubted his message because they did not trust him. So they said, "We have decided to put you through a test. There is a certain tree in the distance by a great drop-off. Down below there is a strong current of water and if you look down there, there are rocks protruding up. We will ask you to climb to the top of this tree, and we will knock it over with you in it. If you survive this, then we will accept what you bring to us." So with that he agreed. He climbed to the highest branch of that tree and then they labored to knock it over. The people came forward and looked over the edge for a long time. Soon they became tired of waiting, and they turned around, but on the following morning something happened. As they looked, in the distance there was smoke rising, coming in the direction of a corn field. They saw him. It was he who had been destroyed, he lived, preparing his meal. So they came back together in that circle and there he assigned the duties of the leaders. He said, "From now on, you leaders who used war to settle your problems, war will be put aside and in its place peace will prevail. You will all have equal height, all you leaders representing the different clan families. You will council for the welfare of the future. Whenever you are in a meeting to discuss any item, your first thought will be projected seven generations into the future, so that the decision you make today will not harm your grandchildren." This is how the Mohawk people were brought together. Today we are known as the foundation of the Great Law of Peace. And from there they traveled in the direction of the Oneida people. They had to overcome their leaders that continually fought amongst themselves. They had to go to the Onondaga, the Cayuga and the Seneca. Before they left the country of the Mohawk people, Hiawatha, who was traveling in another direction, came towards them and he was grief stricken because his wife and his daughters had been destroyed by the evil person who I mentioned before. So at that time, the Peacemaker and Hiawatha met and they worked together. He employed him as a spokesman, because the Peacemaker had a double row of teeth on the bottom and it impeded his speech. Hiawatha became the spokesman of the Peacemaker. The Peacemaker has a name. It is not supposed to be used at any time. There is a day coming, when we will go into the forest and we will ask for his assistance to come back and help us. That is the time, when his name will be used three times. They came to the Onondaga after they had overcome four of the nations. They had reached the Onondaga but the evil being Tadodaho refused to give in to the peace. He was a very evil man. They went by and approached the Cayuga and the Seneca. Everybody had accepted, except Tadodaho and now they tried to win him over by reasoning, by logical means. Still he would not give in. Then the Peacemaker got an idea, because he knows that Tadodaho likes to control and he said, "The union that we have will contain five fires. When these five fires come together, they will become one. For all time to come in the future, it will be your duty to watch over this council fire of all of the Five Nations." Then, and only then, did he accept the Great Law of Peace. The Iroquois Confederacy's Great Law of Peace of Turtle Island was founded in 950 A.D. by the Peacemaker and Hiawatha and comprises the Seneca, Mohawk, Cayuga, Oneida and the Onondaga, the Iroquois speaking peoples of the Eastern Woodlands. There were seventeen clans within the Iroquois League. The clan's Corn Mothers have the real power and are represented by forty-nine Grand Council Chiefs who are selected spokespersons on behalf of the people. During the early 1700's, the Tuscarora people were driven out of North Carolina and we adopted them and gave them some land and they still reside with us. Now today, we are called the Six Nations. To the present day, Tadodaho, the title name, is carried by Leon Shanondoah of the Onondaga people. Now they stood there, the leaders that they had found in those times, numbered fifty. And he instructed them to stand in a circle and hold hands with one another, and they chose this Tree of Peace. A great white pine stood there, tall and strong. It seemed like it pierced the sky it was so tall. As he stood there, at that time, he broke an arrow in front of them. He said, "If you are alone, you are easily broken," and then he took one arrow from each nation, and bound them together and no one, not even the strongest men amongst them, could break it. He said, "In unity there is strength." Then he said, "One day in the future this tree will start to fall, because a people will come here, and they will hack at its roots, and it will start to die. It will start to fall. It will take a long time. You leaders, we have instilled in you to be ever strong. You will be burdened with its heaviness as it lands on your arms. Keep your hands tightly closed with one another. Even if the tree falls, it will never be permitted to touch the ground and when that happens the grandchildren will be born and they will help you to raise that tree again." I feel that we are the grandchildren of those times. Let us get strength with one another and go into the future holding hands with one another and make the world a peaceful place to live for all our grandchildren in the future. Even though we may not see it come to pass, we are starting something for our little ones, they need to have a chance. Today, we have many historians in the archives of Washington, DC, also in Philadelphia, Pennsylvania. 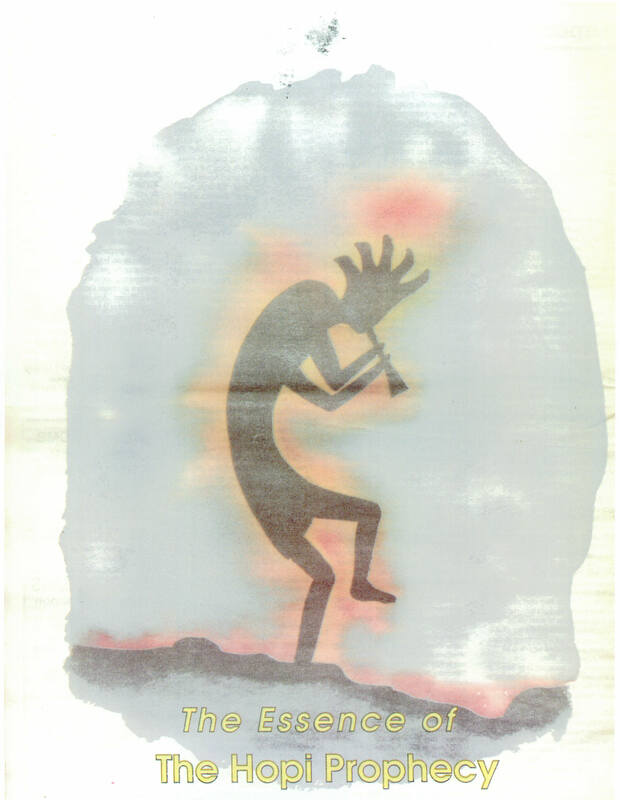 They are looking for documentation on the contributions that were made by the Iroquois people. Our ancestors had great influences. For instance, in 1744, a great chief brought together the twelve colonies. He suggested they unify themselves into one. They were all separated from one another, and he suggested unity between them. Later on, in 1754, there was a meeting in Albany. Benjamin Franklin was there. 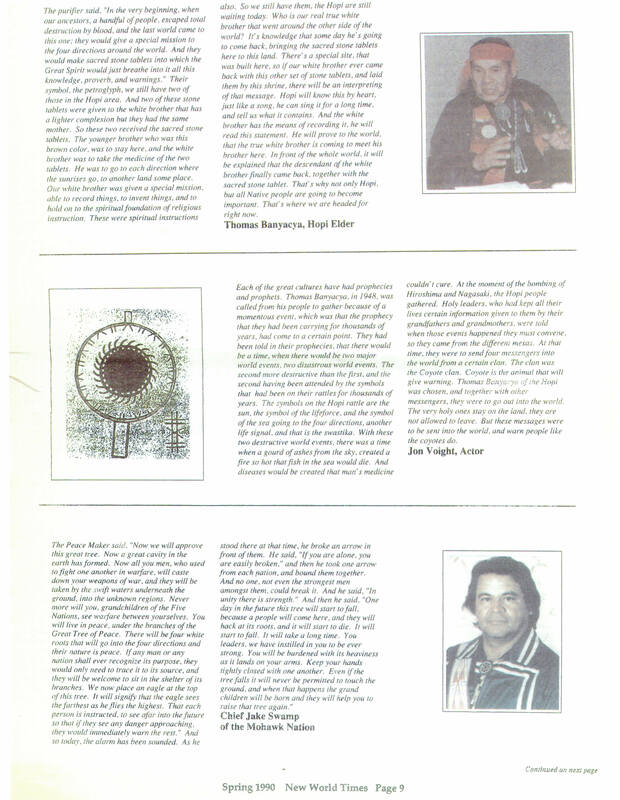 He was inspired by the teachings of the Iroquois leaders. He wished to form a constitution based on the peaceful democratic model of the Confederacy of Indian States. That led into the revolutionary war period and then the birth of the Constitution of United States. We have a tradition of planting trees for peace. Whenever groups of our people came together, in the past in history, the symbol of the Tree of Peace was always present. For instance, after King Phillip's War in 1689, we had a big gathering in New York state, that is what it's called today. We had a ceremony there, at that time there were representatives from France, there were representatives from the Dutch and also from the English, and then we had Mohican people there and the Mohawks, and some of the Algonquin that lived around the eastern coast. At that time they came together around an oak tree and it lived for two hundred and seventy two years. It died in 1948. We just recently had a ceremony and we replaced this tree and we brought together the same representatives. I'm trying to revive this tradition. I've taken it on by myself. I've traveled throughout the world, planting for peace in the hope that we can understand one another by sharing traditions with one another, also to promote the planting of the trees that's very much needed in the world today. In the future, it is going to be very important to many people that are coming behind us. We the ones present will remember this day and we ask all the forces of the universe to be with us today as we dedicate, and light this eternal flame to the cause of peace. We ask all the spirits of the world, and the universe, to be with us at this time. A Peace Pagoda, under construction by Monks of Nipponzan Myohoji in Ladakh, will be inaugurated on August 25, 1990. An invitation has been sent to Hopi elders and other Native American elders to attend this ceremony. Monks of Nipponzan Myohoji took part in the procession carrying the Hiroshima Peace Flame accompanied by the sacred chant, or Odaimoku, Na Mu Myo Ho Ren Ge Kyo, Homage to the Lotus of the True Law. The Peace Flame had previously been carried across the U.S. with the 1986 Great Peace March and from Los Angeles to Moscow with the 1987 American Soviet Peace Walk. This Hiroshima Peace Flame was installed by Kaz Suyieshi, a Hiroshima A-Bomb survivor, at the University of California Santa Barbara Eternal Flame Memorial Peace Monument. "I was born in California, but when I was not quite a year old my parents took me back to their hometown, Hiroshima. It is most difficult for me to talk about my past life. All the time, I wish I could forget. I try many ways, it was most difficult for me for it was a horrible experience. When I was eighteen, every day an American airplane, a B-29, used to come to the city of Hiroshima. This B-29 was a most beautiful airplane. I used to give it the name, 'Angel.' They never dropped a bomb, they never hurt us. To me, it was Angel. The only difference was twenty five years ago, August 6th. It was a beautiful airplane, and a beautiful day with blue sky; I did see Angel. Then Angel disappeared. He left a small spot in blue sky, that's the only difference. I talked to my neighborhood girl, 'I wonder, what is that?' And the girl said, 'Where?' 'There, there.' Then, a very powerful flash. I was unconscious for a while. One moment there was a beautiful sky, and I did see Angel. To me it was heaven, turned to be hell, just in one second. I nearly died because of the radiation sickness." Indian People, original people, visited our country, Japan. We appreciated this. Our people have a long history, long culture. I look back to my country, you can look to the American future. This century is a cleansing time. Clean up your mind. Polish your mirror. If you polish the mirror, the mirror inside becomes very light. See the will of the light, which direction to walk. My master told me, a long time ago, to spread the message, very important message. You can reach the whole world: I believe for the whole world, that change has come. I pray for the future generations. "To trust, this is a religious civilization, to trust heaven, to trust the earth, to trust God. These things will not reply, but we trust without doubting. To save others and to save the world, these are the tasks of the spiritual civilization. The spiritual civilization will eternally shed light that will never terminate. The sufferings of the Indian peoples during the past one hundred and eighty years, and their sufferings today, are a lesson from which we all must learn, so that humankind may live peacefully in the future. However, by bearing this, the bright future life of humanity will be constructed." On June 26th 1945 , the United Nations Charter was signed in San Francisco. The maintaining of international peace and security was declared to be one of its main purposes and principles. An atomic bomb was dropped on Hiroshima on August 6th and on Nagasaki on August 9th, the same year. On October 24, 1945, when the U.N. Charter became effective, disarmament was already a major issue. The United Nations Security Council had to face the urgent task of formulating plans to regulate the production and use of nuclear weapons. In January 1946, the United Nations Atomic Energy Commission was set up. In 1961, the United States and the Soviet Union came to an agreement, and presented a program for general and complete disarmament to the United Nations. 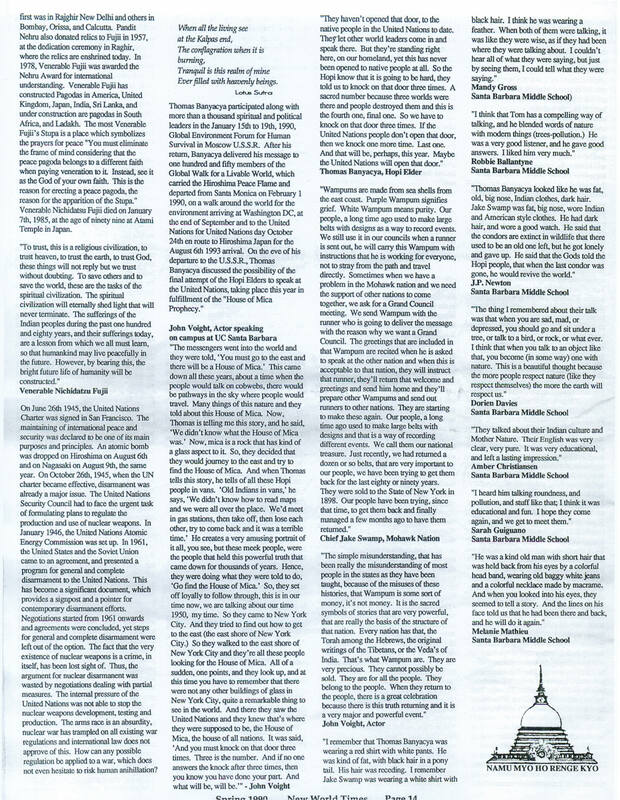 This has become a significant document which provides a signpost and a pointer for contemporary disarmament efforts. Negotiations started from 1961 onwards and agreements were concluded, yet steps for general and complete disarmament were left out of the option. The fact that the very existence of nuclear weapons is a crime, in itself, has been lost sight of. Thus, the argument for nuclear disarmament was wasted by negotiations dealing with partial measures. The internal pressure of the United Nations was not able to stop the nuclear weapons development, testing and production. The arms race is an absurdity, nuclear war has trampled on all existing war regulations and international law does not approve of this. How can any possible regulation be applied to a war which does not even hesitate to risk human annihilation? Ever filled with heavenly beings. Thomas Banyacya participated along with more than a thousand spiritual and political leaders in the January 15th to 19th, 1990, Global Environmental Forum for Human Survival in Moscow U.S.S.R. After his return, Banyacya delivered his message to one hundred and fifty members of the Global Walk for a Livable World, which carried the Hiroshima Peace Flame and departed from Santa Monica on February 1, 1990, on a walk around the world for the environment arriving at Washington, DC, at the end of September, and to the United Nations for United Nations Day October 24th en route to Hiroshima Japan for the August 6th 1993 arrival. On the eve of his departure to the U.S.S.R., Thomas Banyacya discussed the possibility of the final attempt of the Hopi Elders to speak at the United Nations taking place this year in fulfillment of the "House of Mica Prophecy." The messengers went into the world and they were told, "You must go to the east and there will be a House of Mica." This came down all these years, about a time when the people would talk on cobwebs, there would be pathways in the sky where people would travel. Many things of this nature and they told about this House of Mica. Now, Thomas is telling me this story, and he said, "We didn't know what the House of Mica was." Now, mica is a rock that has a kind of a glass aspect to it. So, they decided that they would journey to the east and try to find the House of Mica. And when Thomas tells this story, he tells of all these Hopi people in vans. "Old Indians in vans," he says, "We didn't know how to read maps and we were all over the place. We'd meet in gas stations, then take off, then lose each other, try to come back and it was a terrible time." He creates a very amusing portrait of it all, you see, but these meek people were the people that held this powerful truth that came down for thousands of years. Hence, they were doing what they were told to do, "Go find the House of Mica." So, they set off loyally to follow through, this is in our time now, we are talking about our time, 1950, my time. So they came to New York City. And they tried to find out how to get to the east (the east shore of New York City.) So they walked to the east shore of New York City and they're all these people looking for the House of Mica. All of a sudden, one points, and they look up, and at this time you have to remember that there were not any other buildings of glass in New York City, quite a remarkable thing to see in the world. And there they saw the United Nations and they knew that's where they were supposed to be, the House of Mica, the house of all nations. It was said, "And you must knock on that door three times. Three is the number. And if no one answers the knock after three times, then you know you have done your part. And what will be, will be." "They haven't opened that door to the native people in the United Nations to date. They let other world leaders come in and speak there. But they're standing right here, on our homeland, yet this has never been opened to native people at all. So the Hopi know that it is going to be hard, they told us to knock on that door three times. A sacred number because three worlds were here and people destroyed them and this is the fourth one, final one. So we have to knock on that door three times. If the United Nations people don't open that door, then we knock one more time. Last one. And that will be, perhaps, this year. Maybe the United Nations will open that door." "Wampums are made from sea shells from the east coast. Purple Wampum signifies grief. White Wampum means purity. Our people, a long time ago, used to make large belts with designs as a way to record events. We still use it in our councils when a runner is sent out, he will carry this Wampum with instructions that he is working for everyone, not to stray from the path and travel directly. Sometimes when we have a problem in the Mohawk nation and we need the support of other nations to come together, we ask for a Grand Council meeting. We send Wampum with the runner who is going to deliver the message with the reason why we want a Grand Council. The greetings that are included in that Wampum are recited when he is asked to speak at the other nation and when this is acceptable to that nation, they will instruct that runner, they'll return that welcome and greetings and send him home and they'll prepare other Wampums and send out runners to other nations. They are starting to make these again. Our people, a long time ago used to make large belts with designs and that is a way of recording different events. We call them our national treasure. Just recently, we had returned a dozen or so belts, that were very important to our people, we have been trying to get them back for the last eighty or ninety years. They were sold to the State of New York in 1898. Our people have been trying, since that time, to get them back and finally managed a few months ago to have them returned." "The simple misunderstanding, that has been really the misunderstanding of most people in the states as they have been taught, because of the misuses of these histories, that Wampum is some sort of money, it's not money. It is the sacred symbols of stories that are very powerful, that are really the basis of the structure of that nation. Every nation has that, the Torah among the Hebrews, the original writings of the Tibetans, or the Vedas of India. That's what Wampum are. They are very precious. They cannot possible be sold. They are for all the people. They belong to the people. When they return to the people, there is a great celebration because there is this truth returning and it is a very major and powerful event." "I remember that Thomas Banyacya was wearing a red shirt with white pants. He was kind of fat, with black hair in a pony tail. His hair was receding. I remember Jake Swamp was wearing a white shirt with black hair. I think he was wearing a feather. When both of them were talking, it was like they were wise, as if they had been where they were talking about. I couldn't hear all of what they were saying, but just by seeing them, I could tell what they were saying." 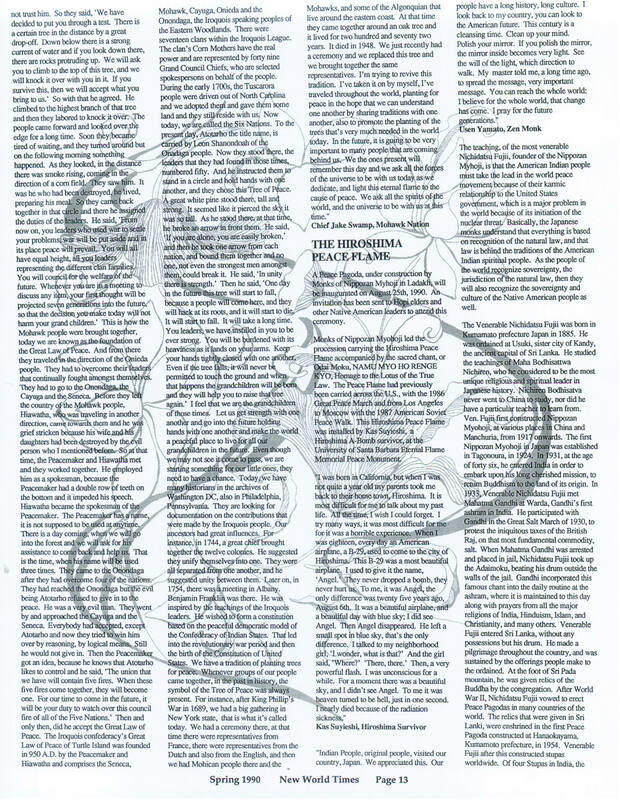 "I think that Tom has a compelling way of talking, and he blended words of nature with modern things (trees-pollution). He was a very good listener, and he gave good answers. I liked him very much." "Thomas Banyacya looked like he was fat, old, big nose, Indian clothes, dark hair. Jake Swamp was fat, big nose, wore Indian and American style clothes. He had dark hair, and wore a good watch. He said that the condors are extinct in wildlife, that there used to be an old one left, but he got lonely and gave up. He said that the Gods told the Hopi people, that when the last condor was gone, he would revive the world." "The thing I remembered about their talk was that when you are sad, mad, or depressed, you should go and sit under a tree, or talk to a bird, or rock, or whatever. I think that when you talk to an object like that, you become (in some way) one with nature. This is a beautiful thought because the more people respect nature (like they respect themselves) the more the earth will respect us." "They talked about their Indian culture and Mother Nature. Their English was very clear, very pure. It was very educational and left a lasting impression." "I heard them talking roundness, and pollution, and stuff like that; I think it was educational and fun. I hope they come again, and we get to meet them." "He was a kind old man with short hair that was held back from his eyes by a colorful head band, wearing old baggy white jeans and a colorful necklace made by macram�. And when you looked into his eyes, they seemed to tell a story. And the lines on his face told us that he had been there and back, and he will do it again." Return to Global Emergency Alert Response Network homepage.